Summit Retreat Great Room, truly lives up to its name. 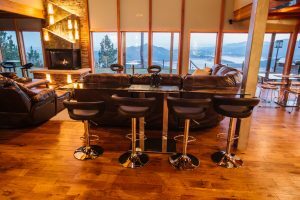 As you walk past the custom mosaic in the entry floor, your eyes are drawn into the great room’s unparalleled panoramic view of Lake Shasta. 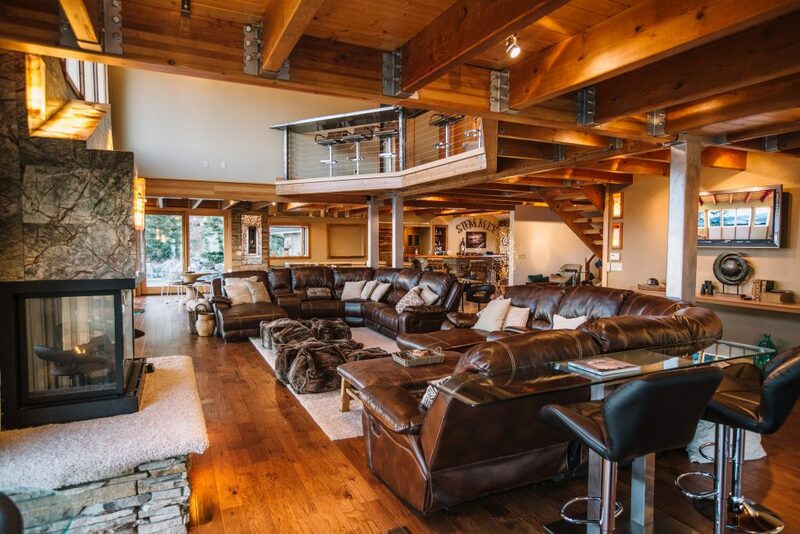 The soaring 30 foot ceilings and wall of windows almost makes you feel like one of the frequently seen bald eagles outside- perched on the mountainside, overlooking a vast majestic kingdom. The great room is truly fabulous, accented by it’s tall custom granite fireplace with inset amber stone lanterns that create a ‘deep light’. Sit in the oversize, leather ‘surround’ sofa and watch the birds of prey fly at ‘eye level’ with you. The beauty of California’s 2nd largest lake with its many islands, surrounded by mountains and the Sacramento Valley all before you will take hours just to take it all in. Truly, a room that can be called “great”.